We’re More then a Gym. We’re A Club. 80,000 square feet – Space to Play and plan your workout. We have 4 Fitness Studios (Yoga, Spin, Fitness Studio & Coaches Cage) with amazing classes & programs. Increase and foster the health and wellness of our community. We want people to fulfill their potential and meet their goals in all aspects of life, and we want to be a key contributor that helps drive and motivate them to achieve everything they are striving for. INTEGRITY: Integrity and honesty are the back bone of our facility. Adhere to our moral and ethical responsibilities and act in good faith when it comes to ourselves, community and membership. COMMITMENT: We are committed to our personal health and the health of our members and community. We strive to see a healthier Kelowna. EXCELLENCE: We want excellence to be the trademark of all we do, and reflective in our programming, training and customer service. Our customer service representatives will help you customize your membership plan. In addition to picking your payment option, annual or monthly, you can also decide what level of access is right for you. A family that stays fit together has fun together! Add on your family members living at same address anytime. Teenagers home from school, keep them fit and add them on to your membership. Tennis court booking – day in advance with a $10 court fees Per Person. We understand when fitness is your passion and the hours of hard work and dedication it takes. We also know that young athletes are not in it for the money. We can customize memberships for individuals and/or teams. Our greatest compliment when our members refer their family or friends. We strive to serve our membership in everyday. When our members refer a *NEW member, we thank them by offering our member referral credit on their account. This in house credit can be used towards membership dues or any of our services. *Some conditions apply, see Front Desk for details. Not redeemable for cash. As the global economy grows, so do businesses and the demands which are placed on their employees. According to The Canadian Council for Health and Active Living at Work, 46% of Managers and Professionals, 49% of Sales and Services worker, and 55% of all trades, transport and manufactures are inactive. Thus, this increase in inactivity is 70 % of the organizations benefit cost, with the top two work related diseases being: Cardiovascular disease and Musculoskeletal (Back and Repetitive Strain) Injuries. Therefore, with the majority of Canadians spending one half of their waking hours at work, it is becoming more and more prevalent that the work place becomes an integral part in investing in their employees’ health. The Global Fitness & Racquet Centre team would like to help your company achieve a healthier, happier, more productive team through effective fitness at the best corporate rates. Our corporate “Options Packages”, offers affordable choices for your company’s commitment to your employees health. This investment will give your company a healthier bottom line. 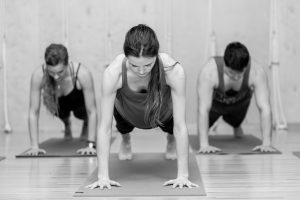 Employers offering fitness memberships as an employee benefit will stand out in our competitive job market and have a higher retention of employees. 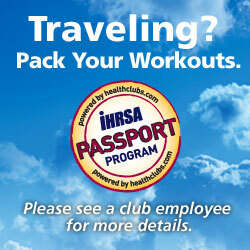 The IHRSA Passport Program, however, makes it possible to enjoy workouts on the road that meet your expectations. Because Global Fitness & Racquet Centre is a member of IHRSA, the International Health Racquet & Sports Clubs Association, and enrolled in their Passport Program, you have guest privileges to a network of quality clubs when you travel. What’s more, the IHRSA Passport Program provides you significantly reduced guest fees- a minimum of 50% savings! Simply ask a Global Fitness & Racquet Centre staff member for a valid code. Purchase your pass online and show the fitness club upon entering. All lifestyle memberships can be cancelled with a full refund within (10) calendar days of purchase.